Death does not separate us from our loved ones anymore than the clouds separate us from the sun. 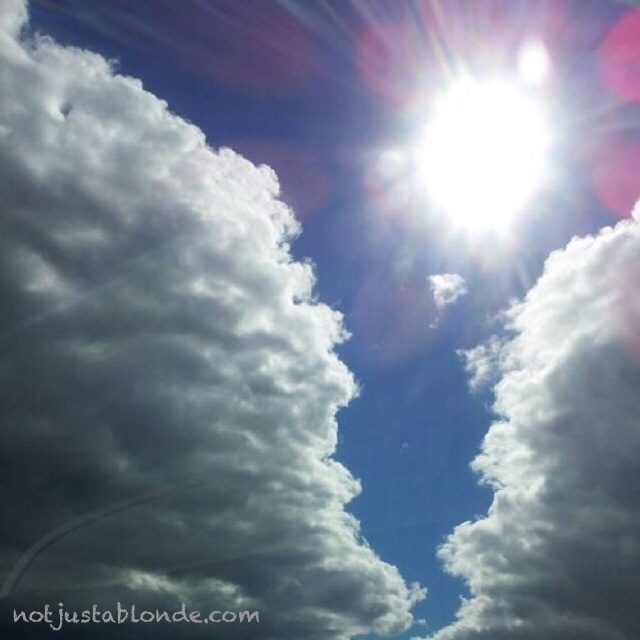 We may not see those whom we’ve lost, yet their light shines through the clouds of life. If our hearts are open we will assuredly feel the warmth of their love. Take comfort in knowing one day the clouds will part and we will see the shining faces of our loved ones once again! The words that loved ones, who have passed on, can continue to influence us years after the words were spoken. As we run through them again in our memory, we might even see new insights coming out of them. My Dad’s words of wisdom often echo through the years as a guide and reminder of the way that something needs to be done and I occasionally speculate whether they have actually come down from my Grandfather, who didn’t live long enough for me to know. Truly words of life! Again, this reminds me of Patsy, of whom I posted recently. What I was not required to tell you at the time was that, before her son Dorien died, God told her that He needed Dorien to die and asked her if she was willing to let him go. She was torn, because she loved Dorien so much, but she wanted to do what God wanted. Eventually she agreed and afterwards thought ‘maybe it will not be necessary’ as God had spared Isaac, when God required Abraham to sacrifice him. However, it was necessary, and Dorien was shot dead. After her initial grief, Patsy started to wonder whether or not Dorien was saved, because he didn’t go to church, and she said to God: ‘If he ain’t there (i.e. in Heaven) I don’t want to go.’ God did not reply, as such, but several friends of Dorien’s told Patsy what a great friend and example of doing the right thing that he had been to them, and how much they had loved him. Hell is a concept that came out of Greek mythology. The worst that can happen to anybody at death is to become nothing; the only alternative is to be in the Presence of God forever. We know now in our hearts that God acts to minimize suffering on the earth. It would seem perverse indeed if He had created an eternity of suffering for people who had not acted in ways that enabled to join Him in Heaven. After death the person ceases to exist. The atoms composing the body are recycled into the environment. You will never meet them again ever. I can agree that a person ceases to exist after death, but only if they have not been brought into the Presence of God, through being aware that the whole universe has been separated from God since the beginning, and that belief in Jesus as the Son of God is the means that God has provided for us to be brought into His Presence. Once we are in His Presence, we have become imperishable.